Representing complete sarcomere the smallest functional unit of myofibril of striated muscle with lines or disks at either end, and scaled to tens of thousands of times actual size, this first-ever working model graphically illustrates the sliding filament theory of skeletal muscle contraction. Reflecting the most recent advances in electron microscopic ultrastructure, the model unequivocally demonstrates that individual myofilaments neither change shape nor shorten, rather the proteins actin and myosin slide past one another, resulting in the shortening of the sarcomere itself. Clearly depicted are the arrangement, configuration, and function of thin filaments (actin, troponin, tropomyosin), and thick filaments (myosin, myosin heads), the M-line and Z-line. 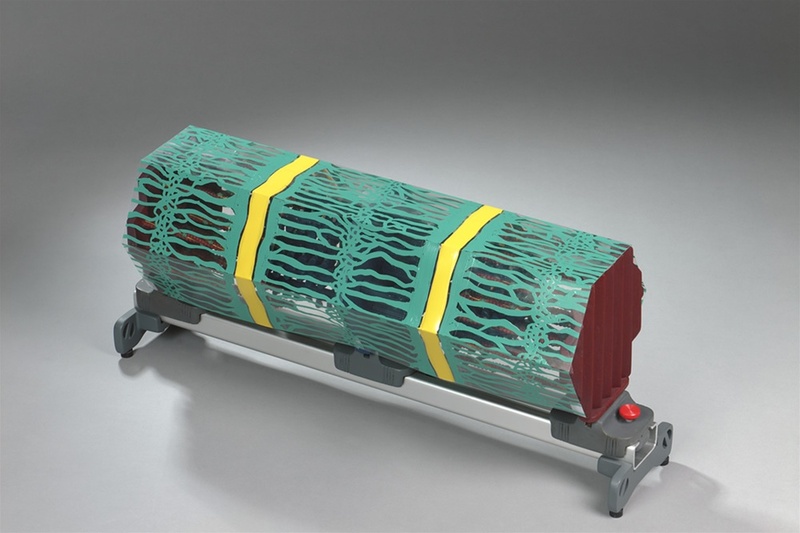 Invaluable not only for physiology classes, but also for athletic trainers, sports medicine specialists, physical and massage therapists, the working sarcomere model can also plainly demonstrate muscle tone, muscle cramps, knots and tears. Included with the sarcomere model is translucent sheath (shown at right) representing the sarcoplasmic reticulum which can be wrapped around the sarcomere to elicit discussion and elucidate understanding of the role calcium ion transport plays in muscle contraction. 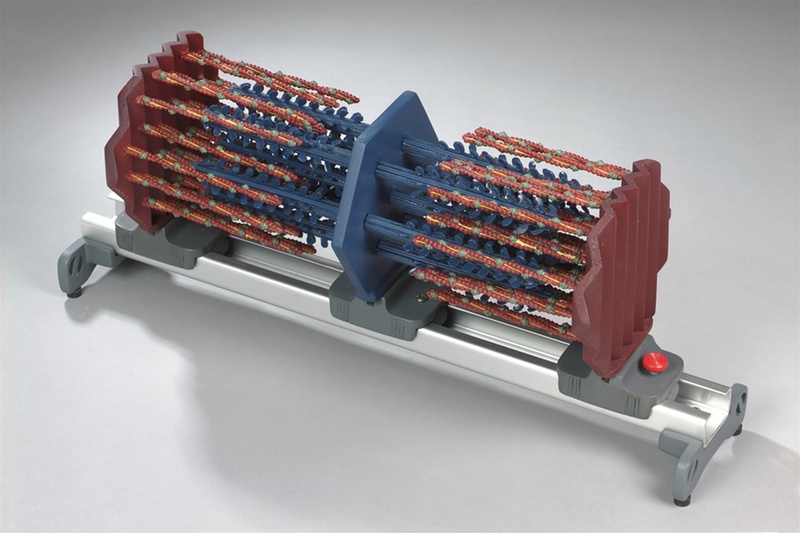 Measuring 22"L 6"W 8"H inches overall, the working sarcomere model comes complete with sarcoplasmic reticulum and user manual. 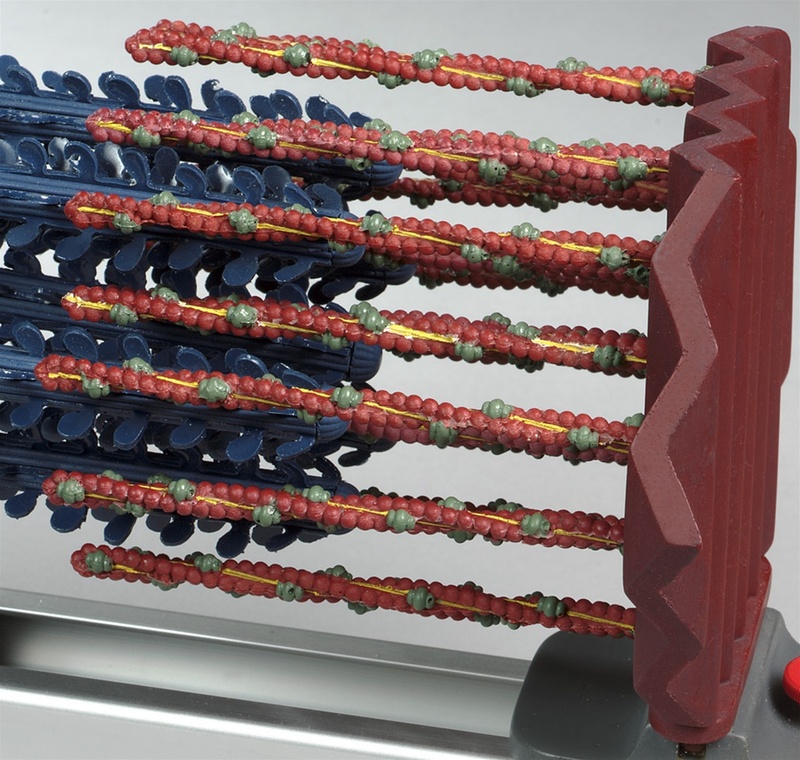 Original Sarcomere concept by Mark Bigelow, LMT, Licensed Masssage Therapist. Patent Pending. Made in the USA by Denoyer-Geppert. This is a great way to get students to visualize sarcomere contraction. I plan to use this along with having students perform a "play" of the steps in muscle contraction physiology.